Does the election cycle stress you out? The other day, I was scrolling through social media, and every other post was about the U.S. presidential election. And as you can imagine, most of it was polarizing and vitriolic. The deeper I got into it, the more angry and stressed out I felt. It seemed to me that there was just no escape from the cataclysmic visions on offer from the media. That’s when it occurred to me. 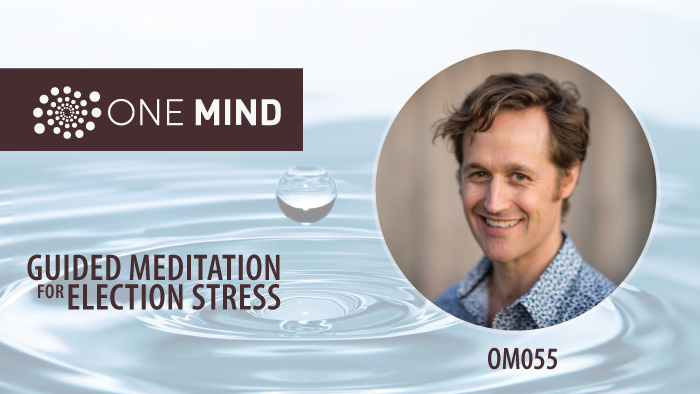 We need a guided meditation to combat the stress of the election cycle. If I’m experiencing this kind of tension and constriction, lots of you are probably having a similar if not identical experience. Every nook and cranny of the media world is overflowing with coverage of the candidates. And of course all of us are invested in one way or another. But have you stopped to question the effect of all this on your quality of life? It’s hard not to feel invested in your candidate. Inevitably, you hear this report or that scandal, or this contrary detail. And you hear that this candidate is ahead, and that one said that horrific thing, and it’s an affront to everything decent Americans stand up for…and on and on. We’re invested. There’s no way around it. I don’t think it’s possible to remain neutral. Now the thing is, this constant barrage of media stresses all of us out. And we’re not always aware this triggers our primitive brain and our fight or flight response kicks in. But there is an alternative. You can be interested in the mechanics of it all. You can foster a more mindful and conscious approach. And in doing so, foster a less reactive approach. And that’s really what we’re talking about here…short circuiting the habitual and mechanical reactivity of our stressed out minds. All this media winds us up and it feels like the world is ending. And haven’t you noticed how completely polarizing all of this is? It’s pretty nuts. But here’s the thing. This is an old story. Probably as old as culture itself. This isn’t new. What’s potentially new is you and me bearing witness to the mechanical patterns of reactivity that get played out in our own minds. When you bear witness and watch the polarization, the fear, and the rising tide of your blood pressure, as you connect the dots and see that following certain trains of thought lead you to conclude that there’s no hope and the world is ending, you can let it go. You can be free of all that momentum. Seeing and observing those patterns is a lot more interesting. Because seeing frees you. It releases you from the grip of reactivity. Now remember, this is not to say that none of this matter re the election. Because it does. The election matters. Your vote matters. Your opinion matters. Of course it does. Public discourse around the issues that constitute our lives matters. But this guided meditation is not about that. It’s about taking this unique moment in time, the lead up to the election, as an opportunity to pay attention to how your mind works. This is a chance to see how right the Buddha was when he identified fear and desire and our resistance to change as the core drivers of human suffering. And I say fear and desire because meditation and mindfulness help you see that your mind and your patterns of thinking become habituated based on what you want and what you don’t want. Our minds glom on to the things we desire. It’s like gravity. And it avoids the things we fear and dislike. That’s how we develop deeply conditioned blinds spots. 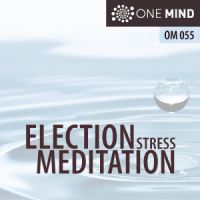 So I want you to think of this guided meditation as an oasis from the stress of the election. An oasis for your mind, for your nervous system, for your body. And the goal is that you want to expand this oasis. And we do that by cultivating a little more mindfulness around how we’re reacting to this whole election cycle. But remember, this lesson applies to any issues or any moments in our lives that are hot. And we all have times like that. They come and they go. That’s why we practice. So we can maintain more discriminating intelligence and more equanimity in the times when it’s particularly hard to be cool. We practice for those times when we’re most reactive and most stressed.